Purchase a minimum of quantity 10 to qualify. 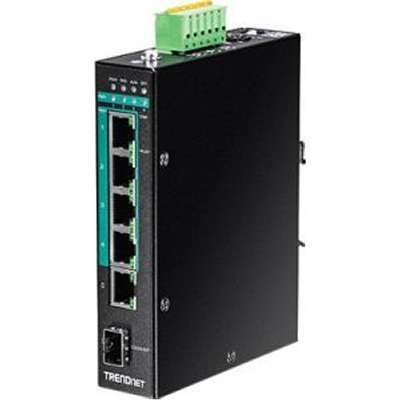 TRENDnet's 6-Port Hardened Industrial Gigabit PoE+ Layer 2 Managed DIN-Rail Switch, model TI-PG541i, has four Gigabit PoE+ ports, one Gigabit port, one Gigabit SFP slot and a 120 Watts PoE budget. The switch is equipped with an IP30 rated metal enclosure and designed to withstand a high degree of vibration, shock, protection against ESD/EMI/surge, and operate within a wide temperature range (- 40 - 70 °C (- 40 - 158 °F)) for harsh environments. L2 management include features such as PoE port control, VLAN, multicast, and QoS which allow for network integration flexibility. Equipped with a rugged IP30 rated enclosure and designed to withstand a high degree of vibration, shock, protection against ESD/EMI/surge, and operate with a wide temperature range (- 40 - 70 °C (- 40 - 158 °F)) for harsh environments. Managed features include PoE per port control/priority/ scheduling/power delay, 802.1Q/MAC-based VLAN, IGMP snooping, per port bandwidth control/802.1p/DSCP/ queue scheduling, and SNMP trap/RMON/SMTP alert/syslog/port mirror for monitoring and flexible network integration. Shop with confidence! Provantage is an authorized TRENDnet dealer.